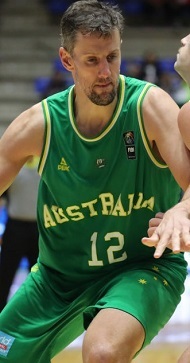 After graduating from Aquinas College in Melbourne, Kickert moved to Canberra where he attended the AIS and as a scholarship holder, he played in SEABL and was named to the All-SEABL Eastern Conference team in 2002. Moving to the USA, Kickert began his college career with Saint Mary's in 2002-03, earning All-Freshman honours and finished the season as the only member of the team to play every game. He was then named to the All-West Coast Conference first team in the following three seasons, while earning WCC Player of the Year honours in his junior year to finish his career ranked first in the SMC books with 1,868 points. He then enjoyed stints in Italy, Spain, Poland and Ukraine before returning home in 2014 to play for Melbourne United in the NBL. Kickert came very close to becoming the first NBL player ever to join the exclusive 50-40-90 club, reaching the required splits but falling four free throws short. However, he completed the feat in 2016-17 with the Brisbane Bullets, averaging 12.8 points while shooting 54.4% from the field, 45.9% from deep and 95% from the free-throw line. Remarkably, in the 2017-18 season, Kickert repeated his efforts from the year before, again shooting his way into the 50-40-90 club, this time shooting at 52.2% FG, 41.8% from three and 92.2% from the line. Internationally, Kickert competed for the Boomers at the 2006 Stanković Continental Champions' Cup, 2006 FIBA World Championship, 2011 London Invitational Tournament, and 2017 FIBA Asia Cup where he helped Australia claim the gold medal with an undefeated tournament. In April 2018 Kickert signed a two year deal with the Sydney Kings.